Starring Rosamund Pike, Jamie Dornan, Tom Hollander, Stanley Tucci, Corey Johnson, Faye Marsay and Nikki Amuka-Bird. The story of acclaimed war reporter Marie Colvin, leading up to her death during the siege of Homs, Syria in 2012. There are few more inspiring figures in modern journalism than Marie Colvin. During her decades as one of the star foreign correspondents on The Sunday Times, Colvin fearlessly put herself in the line of fire to tell the human stories behind conflicts all over the world, including in Sri Lanka, Libya and Chechnya. She was killed in 2012 during a shelling bombardment while covering the siege of Homs in Syria, but left behind a giant legacy. Colvin’s life and career is the subject of the new film A Private War, directed by Matthew Heineman – best known for documentaries Cartel Land and City of Ghosts. At the centre of Heineman’s take on the Colvin story is a fiery, powerful performance from Rosamund Pike in the lead role – her best performance since she earned an Oscar nod for Gone Girl. Pike’s Colvin is a fierce contradiction of a woman, who says she fears “growing old” and “dying young” in equal measure. When her husband explains her compulsion to enter warzones by describing her as “like a moth to a bloody flame”, he hits on the character’s central turmoil. She knows she doesn’t need to push herself as far into harm’s way as she does, but yet she feels somehow compelled to get as close as possible to the reality of war. 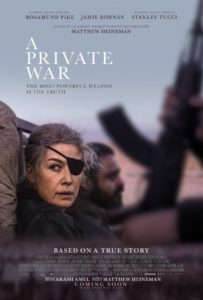 A Private War, somewhat oddly, chooses to create a rather doomy tone from the very start. Rather than focus on the achievements of Colvin’s career, every time jump is described via its proximity to Colvin’s eventual death – we open in 2001, or “11 years before Homs” – in a way that seems to paint everything Colvin did as simply a precursor to her eventual, brutal passing. It’s an unusual stylistic choice and one that frames the story in a way that makes it tough to ever feel Colvin’s importance. Pike’s performance is brave and vulnerable, refusing to ever shave off the rough edges of Colvin’s character. Her relationships with romantic partners, including Stanley Tucci in a brief cameo, are turbulent and inconsistent, while she barely seems to tolerate the people with whom she works. Jamie Dornan boasts a wibbly-wobbly Scouse accent as photojournalist Paul Conroy, while Tom Hollander is typically brilliant as Colvin’s smarmy boss on the foreign desk. Both have a prickly, respectful chemistry with Pike, who always comes across as if she’s holding the men in her life at arm’s length. The film, too, often feels as if it’s holding its material at arm’s length. There are scenes that show Colvin’s inner turmoil and her struggles with alcohol and PTSD, but the bizarre, time-hopping structure never stands still long enough to actually examine the character in detail. 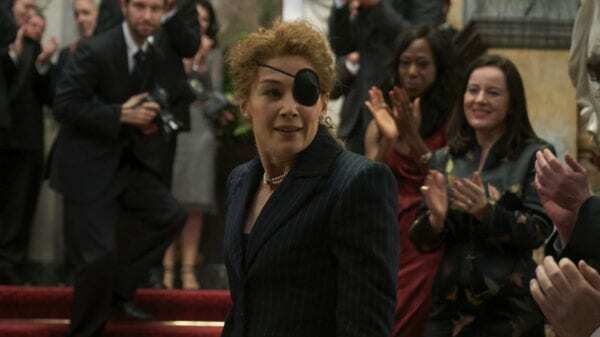 The film runs just under two hours and it’s a rare case of a movie that could’ve done with just a little more narrative breathing room to flesh out the woman behind the iconic eyepatch a little more. But this is every inch Pike’s film, and that’s where A Private War is able to shine. Pike has a window into Colvin and she provides the audience with access to that window, showcasing the real, trauma-addled woman behind all of those incendiary bylines. At a time when journalism is under threat from the public and politicians, this film serves as a reminder of how the best practitioners can shine a spotlight on the best and the worst of humanity.